This is the rebuilt version of the Dunaújvárosring, now it's called Dunaferr 200. The track is better than the old version (more realistic) Current version: -Rebuilt surface and walls -Reobjected More from Dunaújváros: Dunaújváros, known as Sztálinváros from its construction in 1951 to 1961, is an industrial city in Hungary's Central Transdanubia region lying along the Danube river. It is in Fejér county. The city was built around the village of Dunapentele. There are currently no setups for Dunaferr 200. Add a Setup. 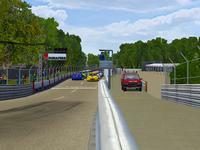 Team ORSM is proud to announce the release of Bathurst (v1.5) with 2010 signage and many other improvements.